Sixteen of Ireland’s leading schools will lock horns this week as the 2016 All-Ireland Schoolboys Hockey Championship comes to Dublin on Wednesday 26 October. The tournament will be played out across 33 matches, seven venues, four groups, and three days of high-octane action that serves as one of the highlights of the Irish hockey calendar. The High School Senior Boys team will go into the competition against the reigning champions Banbridge Academy to battle their way through to the semi-finals on Friday week. The team qualified for the competition last season after winning the Senior Trophy and have been training towards the competition for the past 10 weeks. We would like to wish them the best of luck. This year Ms Hilliard and the Team Hope Team want all of us to make an even bigger contribution to this worthwhile project. But what is it all about? Well, Team Hope delivers Christmas presents to children in areas who would normally never receive such a gift. It is an Irish, Christian organization who helps children and their communities. Team Hope helps communities in the former Soviet Union, Eastern Europe and Africa. And this year, you could help them, by joining people from all over the country and helping to bring joy to children in some of the poorest and remotest parts of the world. Get an ordinary shoe-box, any will do. Then wrap the box and lid in wrapping paper individually. Then put on the label, provided by Ms. Hilliard, stating the age and gender of the recipient. Then use the four W’s as a rough guide to put in your gifts! Write: Something to use at school such as pencil, pen, paper, or a solar calculator! Wash: Some hygiene items – a towel, wrapped soap, toothbrush and toothpaste. Wear: Something to wear – a hat, gloves, a scarf or underwear. WOW! : A treat - something like sunglasses, a game, a toy or a small musical instrument. However please don’t put in war related items, scar items, medicine or chocolate, anything dangerous, liquids which could freeze or spill, or food which could go off. Otherwise, be creative and put in whatever catches your fancy. Also, remember to add four euro to your box to pay for the shipping costs. Bring in your shoe-boxes by the 7 November, the first day back after the mid-term break. Please participate in this worthwhile charity. It's for the children! Get in touch with Ms Hilliard and the Team Hope Team if you have any further questions. This week is Maths Week and, along with all the special activities that the maths classes will be involved in this week, here is a competition that any pupil may enter. All you have to do is come up with a suitable, maths related, either funny or serious question that has the answer "7 penguins". 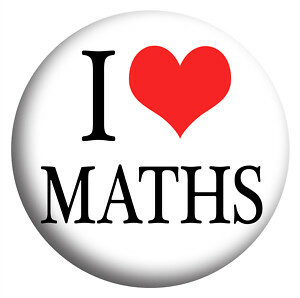 Give your entry to your maths teacher by the end of school on Friday 21st October. There will be a prize for the best question as judged by the maths teachers. On 3 October 2016, the 33rd Dublin Simon Fun Run took place in the Phoenix Park. As always, a large number of High School students and teachers attended. While the weather was extremely wet at the beginning, it soon cleared up and the sun was shining by the time everyone reached the finish line. The five mile run is a pleasant route through the scenic, deer-filled park . Upon finishing the run, everybody received a goody bag and medal and had their photo taken. The Dublin Simon Community is a fantastic charity that works closely with those experiencing homelessness. Their work includes doing nightly soup runs, and providing Mobile Health Units for those sleeping rough. Aside from being an extremely enjoyable event, the Fun Run is an excellent opportunity to raise awareness and much needed funds for a worthy cause. 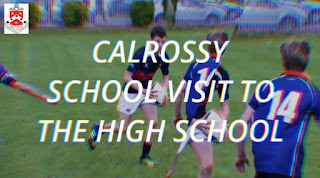 The High School has an excellent reputation for fundraising for this charity, so far having raised over €1,700 and I would highly recommend everyone to get involved with the Fun Run next year, or to sponsor their friends. 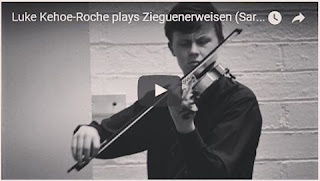 We are delighted to have been advised that an immediate past pupil from The High School has been awarded an Ad Astra Scholarship for Music in UCD in recognition of his exceptional talent as a violinist. The UCD Ad Astra Performing Arts Scholarships are awarded, on an application and merit basis, to students who demonstrate talent and dedication to their art alongside commitment to their chosen academic degree. In 2016, Luke Kehoe Roche (HSD, 2010-16) achieved this notable distinction and has been awarded the Ad Astra Scholarship. 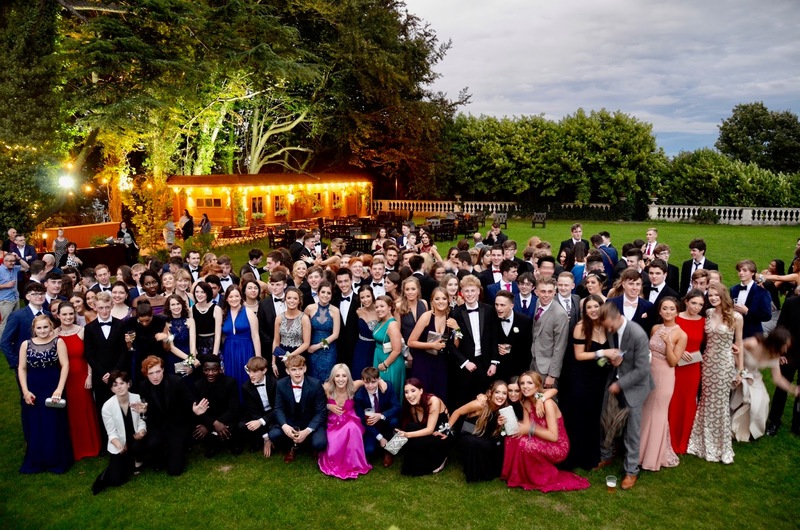 We offer him and all recent past pupils our warmest congratulations on their achievements and wish them every success in their academic careers. Thursday, 17 th November Play, opening night! Friday, 18 th November Play, second night! Saturday, 19 th November Play, closing night!  Dates and times may change. For example dates may be added or taken away. run throughs. Very, very, very, very important to attend.  Any questions, come and see me. 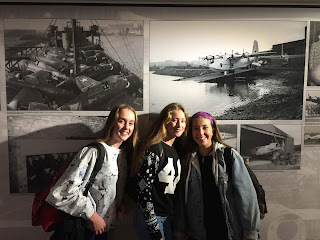 On Friday 30 September and Saturday 1 October, twenty-one students alongside Ms.Beamish made their way to Terenure College, prepared for a long weekend of debating. In Model United Nations (MUN), a student represents a country and debates various topics. The delegates from The High School represented Australia, Japan and the Russian Federation. We spent Friday and Saturday afternoon debating in our committees, discussing resolutions varying from childhood obesity to international terrorism. 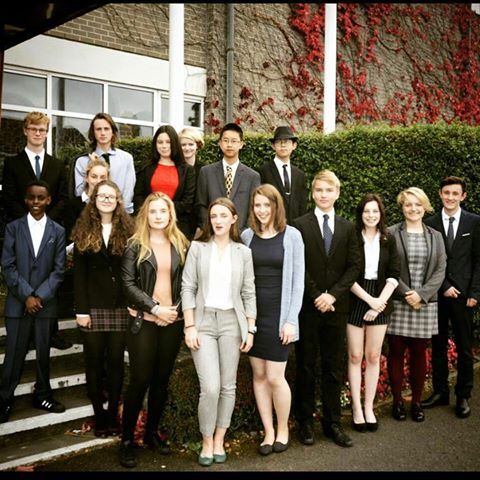 Congratulations to Chloe Holmes who won a prestigious Distinguished Delegate award. It was a really fun weekend. We would like to thank Ms.Beamish and Terenure College for helping to make the conference so enjoyable. On Tuesday the 27 September Form 4 pupils went to the Ulster Folk and Transport museum in Cultra, County Down. We met in the train station at 8.45am and took the train to Belfast Central, followed by a connecting train to Cultra. From here we walked to the Folk museum. We were put into teams and given a worksheet to be completed. We began by looking around the buildings in the re-modelled town, such as the tea room, picture house, bank, post office and printers. Many of us bought sweets in the sweet shop before we left. After the town, we entered the rural area and looked around old fashioned houses and businesses including a forge and a mill. Once finished at the Folk museum we went to the Transport museum where there were hundreds of cars, train carriages and buses. There was also a Titanic exhibition containing recovered artefacts from the sunken ship. We finished in the Land, Sea and Air museum after looking at bikes, boats and planes. We arrived home to Connolly Station hungry and tired but having had an educational and worthwhile day. Thank you to the teachers for organising it. 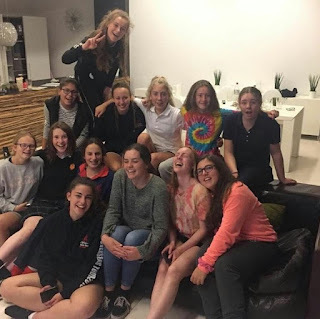 Playing Hockey - Making friends - Thoughts on the Australian Visit. Monday couldn’t come fast enough as we all awaited the arrival of the Calrossy team. That evening was spent getting to know our billets, meeting up in small groups for a night of culture exchanges and many laughs. We got to know the girls really well and this calmed our nerves immensely as they were such a lovely group of players. Our match the next day was one not to forget; both teams put up a hard fight but The High School went ahead to win 3-0. The atmosphere surrounding the match was incredible. We all felt as if we had always known each other. Both teams then met in the Dining Room for refreshments, where a presentation was held. Later that day we had managed to round up almost everyone from both teams for their last night in Dublin. The next morning was an early start in order for the touring team to catch their ferry in time. Goodbyes and "good lucks" were shared and they got on their bus to the next destination, waving as they left through the front gate. The few days were well enjoyed by both teams knowing we had all made new friends. gruelling minutes of battering one and other, you can still come together and have a laugh. The atmosphere in the Dining Room afterwards was buzzing with chat, laughter, and applause as the players shared food and drink with their opposite number and discussed plans for later that evening. needs to know. You learn about nutrition, how to cook and how to sew and knit. 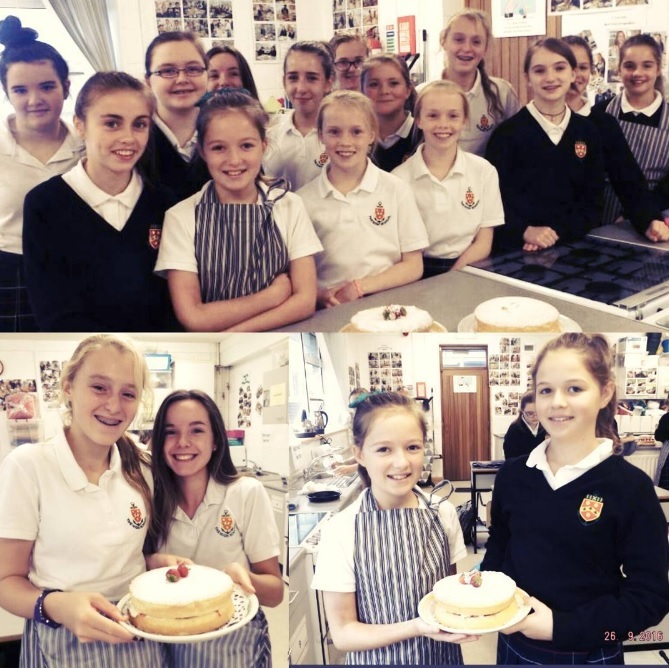 We won’t be knitting until after Christmas, but we are learning how to bake - we have baked cookies, scones, a sponge cake and some thing of our own choice. We have also learned about the nutrition the body needs. If you chose Home Economics, brilliant! If not, change to it now! 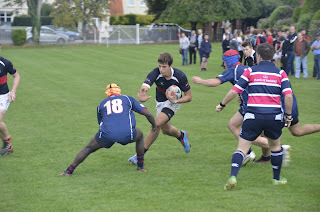 The High School Girl's 7s rugby team competed in a tournament yesterday, Thursday the 9 October. We played 4 matches of 7 minutes a half. Our first match began at 10.30 against Mount Temple, which we won 5-4. We then played Firhouse with another win, putting us through to the semi final. The semi final was played against St. Raphaela's School with an 8-0 win for The High School. By earning a place in the final, we were automatically put through to the Leinster tournament to be held in Donnybrook. We elected to play the final anyway against St Louis High School which finished with a win of 6-4 to us. The High School became the Girls' 7's Dublin Champions and were put through to the next round! We got lost on the way, a teacher driving behind a parent on route to the The High School debutante ball at The Radisson Hotel; not a great start I grant you. And when we dipped into the car park I felt like Orpheus slipping into The Underworld, a little uneasy, as teachers always are at these events, in case you forget someone's name or you say the wrong thing. But I was there to see the kids, to see them off for the last time, to mark the end of their six years at The High School, and if the worst came to the worst I could always hide behind my camera and pretend to be working. Two steps out of the car and I was hailed from the shadows by a kind High School parent who called me 'Miss' and by my surname, and I immediately felt at ease. The pupils would be along shortly I was told, so we waited in the reception room, circled together like wagons in a western; I could sense a little anxiety. The talk was of their children's first day at university , an exam some had tomorrow, how they were still settling in to their college courses. Some had been under the weather, 'all those new germs', new people, new places. 'Just like when they started creche!' someone said and I could suddenly see it in their eyes - the anxiety of the new parent on the first day of school. They were going through it all again, the hope of success, the pain of separation, something I knew something about. 'This is the end of 12 years at The High School for our family', said another shakily. "That's something..."
And with the phrase still hanging in the air, there was a whir of excitement, a blur of colour and suddenly they were there, the butterflies and peacocks, with laughter and news, embraces and that sense of camaraderie that is so special to High School pupils. Gone were their baggy, black jumpers, and ponytails: in a matter of months they had transformed into fully grown, radiant young men and women, every one at least two inches taller I was certain. "I've changed course Miss. I'm doing English after all!" ... "I'm still writing everyday, but Maths is creative too, Miss." And then I glimpsed a boy bending down to kiss his mother's upturned cheek - a goodbye. The parents, judging the time to leave far better than I, seemed to melt away. 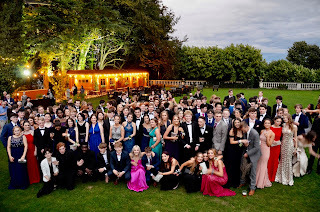 So again I followed, casting one last, backward glance at the Class of 2016, golden under yellow light, those pupils who had taught me so much during their time at The High School. I left, passing up, out of The Underworld, to a star-filled sky. There'd be no getting lost this time, and I suddenly knew, this was no true ending, rather a commencement. And I consigned the evening to memory, for I had not taken a photograph, not a single one. 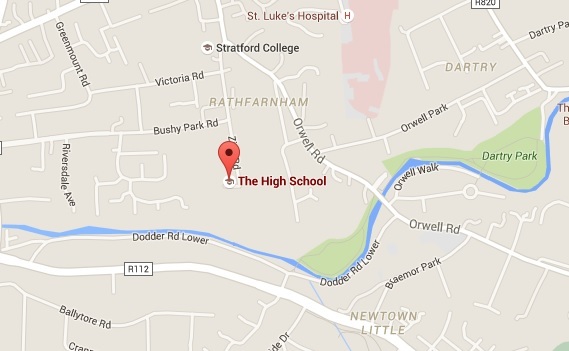 The High School is delighted to announce the introduction of a new transport link from the HSD car park to Blessington via Terenure, Templeogue, and Tallaght every day after school with effect from Monday 3 October at 3.55pm (and every Monday, Tuesday, Thursday, Friday at 3.55pm and Wednesday at 1.15pm thereafter) until further notice. It will also be possible for pupils living along the route from HSD to Blessington to use this service on a daily basis if they wish to do so. The service will be provided by 'Express Bus' whose company name will be clearly displayed on the side of the vehicle; all 'Express Bus' drivers are Garda Vetted in accordance with current legislation. The cost will be 90c (cash only) for any stage of the one-way journey; alternatively, it will be possible to purchase a book of 10 journeys for €8. You should note that Leap Cards cannot be used for this service. However, Leap Cards remain valid for all inward Dublin Bus routes (including the No 65 bus) in the usual way. If you have any queries about this development please do not hesitate to contact the Office. So You Want To Get an A in English? 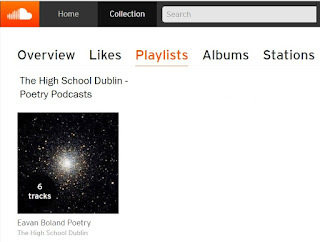 Form 5 English pupils have created a series of audio recordings of the Eavan Boland poems that are on the Leaving Certificate course for 2018. What an easy way to learn-off those key quotations for the BIG English exam on Tuesday!